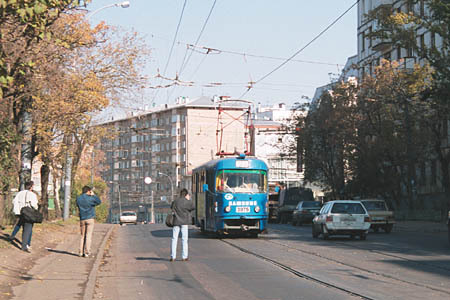 Trekhgorniy Val street connects Krasnopresnenskaya Zastava square with Schmidtovskiy Proyezd. Indeeed, the street is not a very broad one, but I suppose there is no such a broad street that cannot be totally occupied by motorists. Schmidtovskiy Proyezd begins here. The rear buildings are in Trekhgorniy Val street. A green park covers a large area to the Krasnopresnenskaya Zastava square. 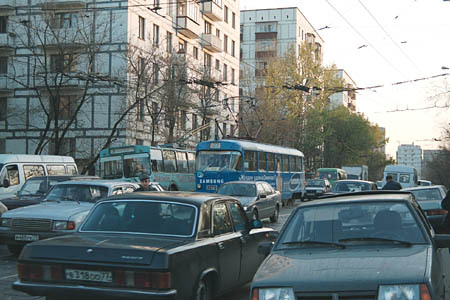 A typical view of Trekhgorniy Val in a rush hour, with trams, trolleybuses and motorcars all mixed in one jam. They hope that this jam problem can be solved by removing trams, but I doubt - as you can see, a tramcar does not occupy as much space as motorcars do. 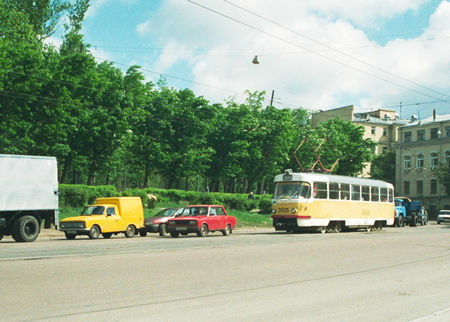 A view of Trekhgorniy Val looking towards Krasnopresnenskaya Zastava square. As you can see, on Sunday noons a number of autos is much less. But a number of photographers taking pictures of tram times going by is high.